An inspirational book capturing the wonders of trekking in Nepal, in eight vivid stories from Kev Reynolds' journals exploring the Himalaya. 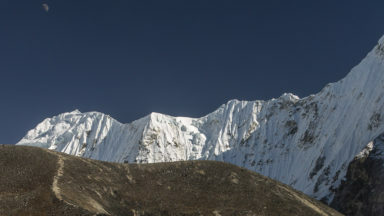 Landscape, people, sounds and smells come to life as they are encountered for the first time in the Everest, Annapurna, Langtang, Kangchenjunga, Manaslu, Dolpo, Mugu and the far west of Nepal. 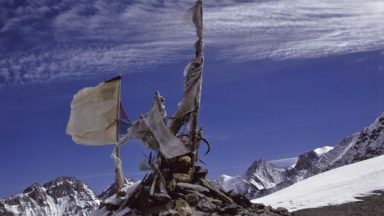 On eight treks in Nepal's Himalaya; to Kanchenjunga, Manaslu, Annapurna, Everest, Langtang, Dolpo, Api and Mugu, the true spirit of trekking is captured in Kev Reynolds' reverence, curiosity and ongoing love of the world's greatest mountain range. The Himalaya are no ordinary mountains. Stretching through five countries and dwarfing all others, they have captured the imaginations of travellers and mountain lovers for centuries. While some seek to reach their snowy heights, many more step out onto winding and climbing trails to trek through the heart of the mountains, and live - if only for a little while - the life of an adventurer. The first time a trail is explored offers unknown beauty and fresh experience around every turn. 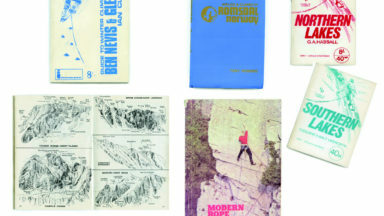 This is Kev Reynolds' collection of eight such discoveries along popular trails and into lands previously locked away. Brought to life in vivid style, Reynolds evokes the scent of fragrant rhododendron jungles and travelling past terraced fields, hillside villages and ancient temples. Then exploring into hidden valleys beyond the reach of civilization, and on to towering, ice-locked peaks that scratch the sky. All proceeds from sales of this book will be donated to the Nepal Earthquake Appeal. "This is not a guidebook but more of an exploration of Reynolds' passion for the country, its mountains and its people... You will be intrigued and enthused by the author's evocative and empathetic descriptions of the country, its people and their customs... There are many descriptive passages that make you feel you are almost there with Reynolds, looking out at the sunrise, the morning mist or whatever. Whether you have already been to Nepal, are thinking of going there, or just want to visit it from your armchair, I think you will enjoy reading this book. There is so much of interest in it. Apart from the pleasure to be gained from reading this book, there is the added pleasure of knowing that, by buying a copy, you have also made a contribution to supporting the ongoing work to repair Nepal's badly damaged infrastructure. It will help these wonderfully resilent people to reconstruct their lives following those terrible earthquakes there." "Kev Reynolds is one of my favourite outdoor writers. He's told me frequently that he's the man with the best job in the world, travelling to and writing guidebooks to some of the planet's finest walking destinations... Kev Reynolds loves the richness of the landscape and appreciates his good fortune in being able to do what he does. 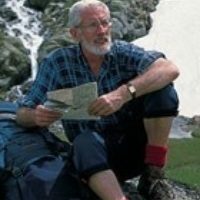 Few westerners have trekked [these] ranges as extensively as Kev, and his accumulated knowledge and experience is formidable. 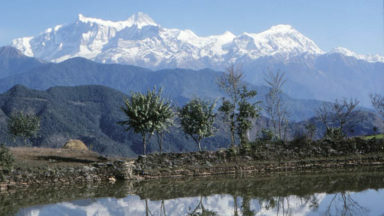 Abode of the Gods is a distillation in narrative form of several of his trips to the Nepal Himalaya. His style is laid back, almost meditative, evoking an air of deep contentment at being amid such a beautiful landscape, among the happy and generous people of Nepal. Kev's love for Nepal and its people is evident not only from the text but from his actions. 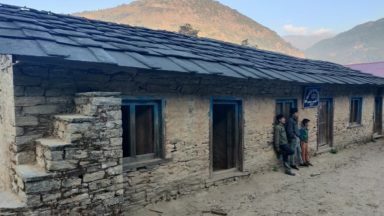 All profits from the book will support on-going earthquake relief, He raised £15,000 by organising an auction evening - which included a Nepalese-style meal - and has lectured about the book to raise more funds. The money will be donated via Doug Scott's Community Action Nepal charity (www.canepal.org.uk). Abode of the Gods is a fabulous book which will be thoroughly enjoyed by anyone with a love of the Himalaya or indeed trekking abroad in general." "An inspiring book... For those who love, or have yet to be embraced by the mountains and people of Nepal"
Leading outdoor writer Kev Reynolds has explored Nepal like few others. 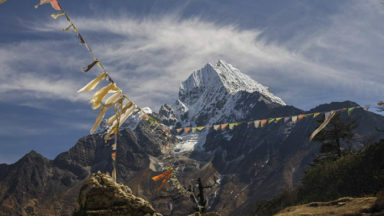 Trekkers may rush to Everest and Annapurna, but these eight tales also take the reader into the remote and wild east and the far west of Nepal, regions where few have ventured to go. With chapters covering Kangchenjunga, Annapurna, Everest, Langtang, Mansaslu, Doplo, the Far West and the Mugu region, Kev Reynolds tells of his first explorations in each of these trekking areas, spread over 25 years, his love of the land and its people maturing with each visit. Nepal and especially the Nepali people are the stars of this book, while the trekking experiences of teahouses, tents, death·defying flights, on-trek food, and the company of like -minded trekkers will be immediately familiar to those who have visited this wonderful country. Life in Nepal is never far from tragedy, and publisher Cicerone will be donating profits of the book to charities working directly with Nepali communities in earthquake affected areas. Kev Reynolds is a prolific guidebook writer who's spent large chunks of his life in Nepal, and this book recounts eight of his most memorable adventures among the world's highest peaks. It focuses on challenging walks rather than mountaineering epics, exploring the trekking haunts, towns and teahouses from Annapurna to Everest. It's full of personality, with profits being donated to the Nepal earthquake appeal. Everyone who has travelled in Nepal will find something to like about it, and most will find themselves nodding in recognition at several passages. And if you’ve not been to the Himalayas, some of his descriptions are more vivid than any photograph.